He later was selected to lead ISAF in Afghanistan, a position from which he resigned and then retired from the Army following a critical Rolling Stone magazine article that revealed comments by his staff deriding President Barack Obama and key figures in the administration. 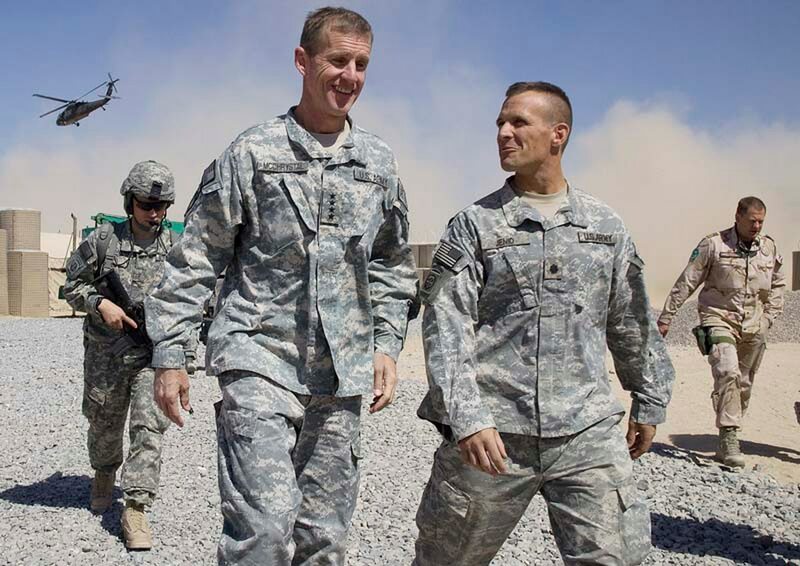 Following retirement, McChrystal first headed an advisory board on military family support. He subsequently has taught leadership courses at Yale University, joined the boards of various private companies and nonprofits and authored three books. He spoke about the new book recently at the headquarters of the Association of the U.S. Army in Arlington, Virginia. McChrystal and his co-authors, Jeff Eggers and Jason Mangone, sifted through centuries of examples of leaders before landing on 13 leaders to profile from a wide variety of backgrounds, the majority non-military. But one that easily caught the attention of the audience and likely close readers of McChrystal was one of his own rivals – Abu Musab al-Zarqawi, the acknowledged founder of al-Qaida in Iraq and inspiration for the founders of Islamic State. McChrystal led the special operations forces who hunted down and killed Zarqawi in 2006. He personally went to the bomb site to identify Zarqawi’s body. Though, McChrystal noted, while effective, Zarqawi’s brand of leadership stemmed from zealotry and was not sustainable. But even in that, he found something to question, to learn. Another of the book’s profiles turned the lens on Dr. Martin Luther King Jr. Many remember his famous speeches and marches but he was not always the de facto leader of the Civil Rights movement, the general said. King was a 26-year-old pastor at a church in Montgomery, Alabama, when he began his leadership role in the movement. He was far younger, less experienced and recognized than many in the movement, even in Montgomery. But his youth, energy and ambition drew people to him. Even his iconic “I have a dream” speech wasn’t planned or scripted. He was one of a long list of speakers that day in Washington, D.C., and was 11 minutes into a prepared speech that wasn’t keeping the audience engaged. But then, from behind him, singer Mahalia Jackson told him to tell the audience about his “dream.” The dream speech had been delivered in portions to various groups during his lead up to the D.C. event. And unlike other organizations or movements, King’s effectiveness, McChrystal said, is evident in that the movement continued and succeeded in many areas after his assassination. It didn’t fall apart when the leader was gone. McChrystal was quick in response to an audience question about how the Army brings in people with special skills or expertise into the ranks. The key area that’s been proposed in recent years is having cyber specialists come in at higher ranks so that the services can be competitive with industry in bringing in certain talent areas. He did emphasize that the military system is good at building leaders. That stems from the inordinate investment in time, energy, funding and manpower that is rarely seen in private industry. But, he said, there are different approaches to add to meet defense needs. “We have a guild system in the military. You can’t be a captain unless you were a lieutenant. We change that in wartime but the reality is our mindset is if you weren’t at the wedding you really shouldn’t be here," he said. “I think that’s a mistake nowadays. I think we should be taking people in laterally. And that’s very threatening to people that are in the guild. A challenge is getting that talent to appear credible, he said. "We could bring in experts, but if we just bring in experts they’re always going to be viewed as not real … and I actually don’t think that is the best approach,” McChrystal said. Despite his military career in leadership roles and the collaborative research he and his co-authors conducted to dig into what makes leadership work, there’s no clear answer, McChrystal said. And though there are indicators of what makes a leader effective, the needs of the mission, project, movement or organization alter what is needed from a leader. “We actually don’t know how to tell you to be successful. We can tell you how complex it is. What it comes down to is, I can tell you the things we think that make leaders so effective is having the right values,” he said. In today’s world, it’s the people who are humble enough and empathetic enough to listen and discern what the situation is, what’s required, and then adapt themselves to that requirement who are going to be the most effective, important leaders of the future. “I don’t think it’s going to be the person who’s figured out what’s right and then say ‘okay this is the way we do it’, ” he said. McChrystal has been critical of President Donald Trump’s conduct but sees that Trump’s rise to the presidency holds lessons not only about leaders but those who look for leaders. “I think if we look at President Trump, he emerged, he didn’t create the dissatisfaction that caused him to be successful in the election. There were already things brewing in the American political system so he emerged from that situation,” McChrystal said. "I think almost independent of his personality what we need to do is look in the mirror right now. Stop looking at Trump or Rep. Nancy Pelosi ... or Sen. Chuck Schumer ... or somebody else, look in the mirror.